At CoMo Power Wash, we work hard to please our clients. Commercial clients have large parking garages that need regular maintenance which includes pressure washing building structures. Your business property needs to be clean and safe. Pressure washing a parking garage removes unsightly stains and contaminants from the surface of the parking garage. Removing debris, oil, and dirt creates a safe walking surface and makes it smell better. A dirty parking garage scares off potential customers who use the garages for short-term and long-term parking. Improving your parking garage increases your business by drawing in new customers. Call us today for a free consultation appointment. We provide same day or next day service and free written estimates. Our satisfaction guarantee provides you with the assurance that your investment is protected. Your parking garage reflects upon your business. Don’t lose prospective clients because the garage is unclean. Improve your parking structure with regular pressure washing maintenance. 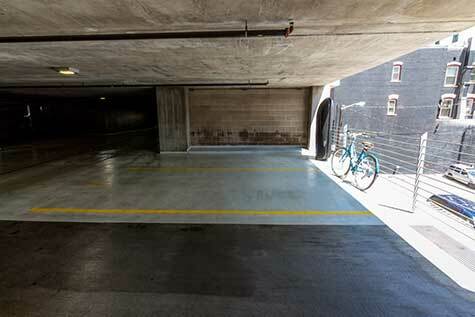 Make your parking structure safe and clean for your clients. CoMo Power Wash offers business owners an effective way to keep their parking garages competitive. With our skilled pressure washing team, we can show you that keeping your parking garage free of contaminants can increase your business. Our regular customers who are parking garage owners and property managers tell us their parking customers need clean and safe parking garages. They claim that by using pressure washing to effectively clean the parking garages, their business increases by attracting satisfied parking customers who expect well-maintained parking structures. 7200 N. Oakland Gravel Rd.